This week I have mostly been inspired by … The Arts Barge Project – their impressive and inventive plans to provide a community arts venue on the river, on a barge. Many readers of this website will remember the Arts Centre, in the old St John’s church on Micklegate. This project would provide a replacement, river-based venue. I’m hoping that some ex-Yorkies who I know have fond memories of York, and of the Arts Centre – and who have maybe not yet heard about the funding campaign – will help the Arts Barge Project reach their target. The vessel pictured is the one they’re hoping to buy – or if not, similar. 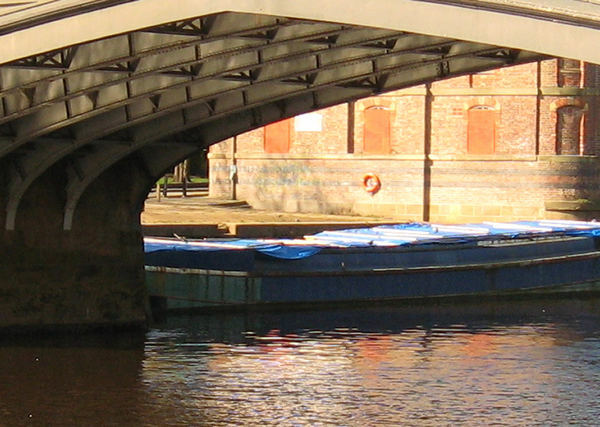 It might not look like much just now, and was referred to as ‘that floating skip under Skeldergate Bridge’ in an amusing message on Twitter. But it looked handsome enough for me to take the photo above, when passing about a month ago, though I didn’t know at the time that there were plans for it. It just caught my attention. By the Bonding Warehouse, in the heart of the city, it was good to see a vessel which wasn’t just there for tourist trips. It would be good if it wasn’t just sitting there waiting for something to happen, but instead was a happening place. It’s often said that we should make more of our rivers in the city. Here’s a brilliant opportunity to do so. Have you got some money …? I missed the event last summer, shown on the video on their website. Did any readers participate in/visit? « WW2 photo – can you help locate? Last summer’s events sound good – sorry I missed them, and recommend the video on the Arts Barge pages (on the link included above) to anyone else who missed them. I attended a couple of last year’s events, I took my daughter too and we both loved it. I even got my parents down there most days for coffee and cake. It is a brilliant idea and, as earlier posts have stated, the organisers are lovely as were the patrons. I will most definitely be a frequent visitor when it is up and running. I have vague memories of the old Arts Center, of spending a day there making puppets when in primary school, it encouraged my creative passions and I know the Arts Barge will do the same for so many youngsters. I can’t wait to get my daughter’s school/class involved. Good to see that the £5,000 target has been reached! Though of course support is still needed, and welcome.